Early April through middle of April is the ideal time to plant America's favorite tuber, the potato. "Growing potatoes can be an easy gardening activity while producing delicious dishes that cannot be recreated with a store bought potato," says Kelly Allsup, University of Illinois Extension horticulture educator. Potatoes like loose soils to form their tuberous roots with ease. They produce when the soil temperature is between 60 and 70 degrees and will cease growth when it reaches 80 degrees, so they are considered a cool weather crop. Please consider the following steps when planting. Use seed potatoes that you buy from the garden centers and not from the grocery store. The grocery store potatoes have been sprayed with a chemical that prevents them from sprouting. Cut large seed potatoes into pieces that have two eyes. These eyes will be where the plant forms sprouts. Plant pieces eye side up and 2-3" deep, 12-18" apart and 24" between rows. Add complete fertilizer at time of planting and again when the foliage is 4-6" tall. Water at least 1" a week. 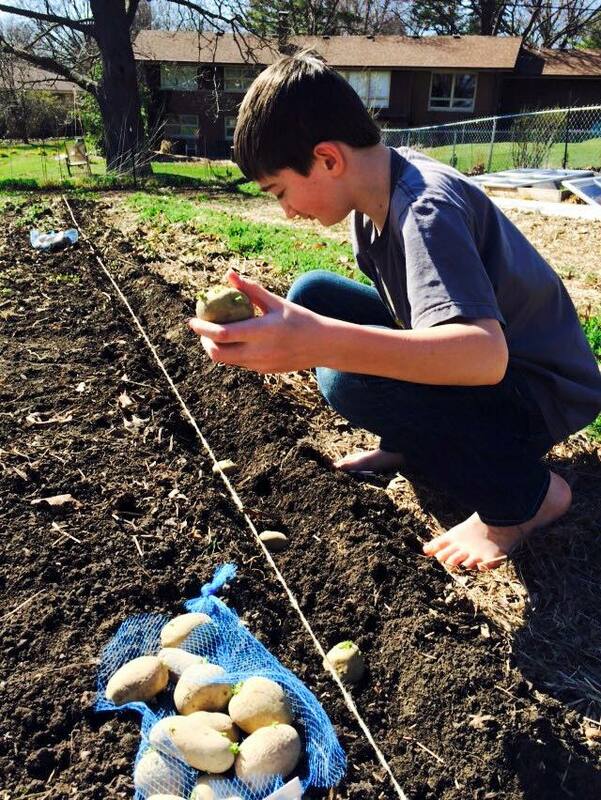 Potatoes require a garden method called hilling. Hilling just means that you are mounding the soil up around the foliage as it grows. 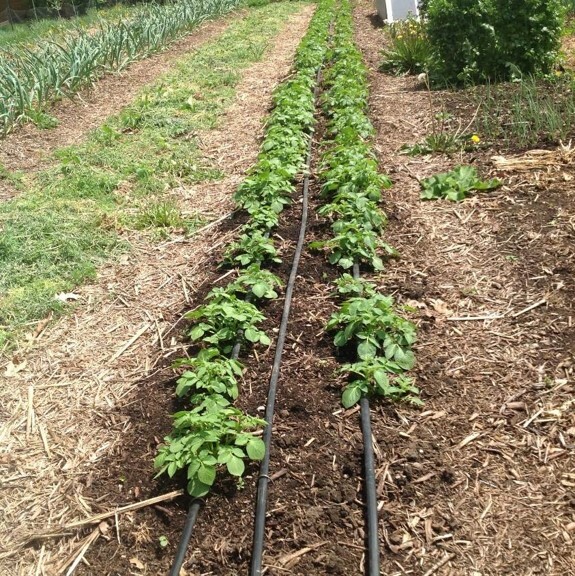 This garden method prevents weeds and a condition known as green potatoes. When potato tubers are exposed to the sun they turn green indicating a buildup of a poisonous toxin called solanine. Adding an organic mulch-like straw will keep the soil cool. Some gardeners grow their potatoes in a bail of straw or in layers of straw to make digging easier. Remember, if you are going to grow in a straw bale then you need to cook it first by adding a combination of water and fertilizer for about 14 days before planting. A pest called Colorado potato beetle will eat the leaves starting in late May. The larvae and adults feed on the potato plant leaves, and they lay bright orange eggs in clusters on the stems and foliage. University of Illinois recommends a biological pesticide containing Bacillus thuringiensis tenebrionis to kill Colorado potato beetle larvae. This microbial insecticide kills the target pest without killing other insects. Potato tubers will be ready to harvest in 70 to 100 days or when the foliage dies back in July. Scout early and plant flowers to attract beneficial insects. Sometimes the foliage will produce small, inedible, green tomato-like fruits. Gently dig up tubers making sure not to damage the skin and cure in a cool, dark place for at least 10 days. If the skin is damaged, then this is the first tuber to dine on. If potatoes are green, then cut that part off and eat the rest.